I already know that I am going to get flack for my prediction in this race since a lot of people have a beef with John Campbell. For the record this is actually the Congressional seat that now represents me, with Anaheim Hills being drawn in by the redistricting commission. Republicans have a 17 point advantage in this seat along with a conservative leaning DTS crowd that is just 6 points away from making the Democrats totally irrelevant in this seat. (Democrats 28, DTS 22). What used to be CD 48 moved a lot further north eliminating Newport Beach and picking up Orange/Anaheim Hills among other changes. This seat is a pretty safe Republican seat on paper despite the fact that Barack Obama came within 4 points of McCain back in 2008. 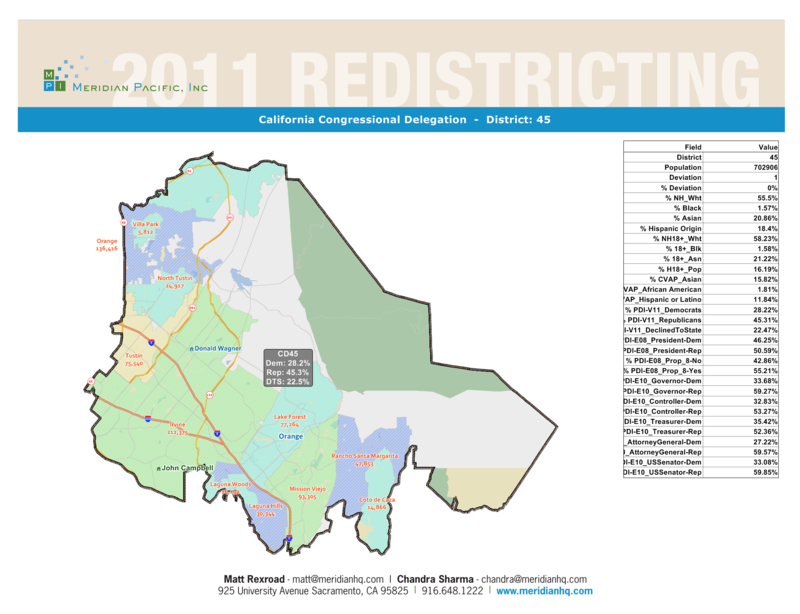 Incumbent Congressman John Campbell is currently representing a good portion of this district in CD 48. Which will make him the clear front-runner despite a couple of challengers taking him on this election, including another Republican. His challengers include Sukhee Kang the Mayor of Irvine who is running as a Democrat. This is the second time that a member of the Irvine City Council has run against Campbell after Beth Krom ran back in 2010. The other challenger is John Webb a Tea Party Republican who opted to run with the (R) next to his name as opposed to (NPP). He is listed as a small business owner on the ballot. The factors at play- John Campbell is the incumbent and has represented the majority of this district thus boosting his name ID. His ability to send out mail and fund a comprehensive campaign make him the front-runner to finish first on the ballot in June despite the Republican vote being split. John Webb seems like he is a good guy and he has a backing of some tea party folks behind him. His fundraising numbers just don’t lead me to believe he can get his message out to enough voters to get into the top 2. Had he listed himself as (NPP) on the ballot I think he might have been able to finish ahead of Sukhee Kang. Sukhee Kang despite being wiped out by Kindee Durkee has name ID in Irvine, which is a good-sized part of CD 45. He is also the only Democrat on the ballot. Based on his name ID and party affiliation alone I believe that he will advance to November. This entry was posted on April 11, 2012 at 9:50 AM	and is filed under 45th Congressional District. Tagged: John Campbell, John Webb, Sukhee Kang. You can follow any responses to this entry through the RSS 2.0 feed. You can leave a response, or trackback from your own site.